This article first appeared in Personal Wealth, The Edge Malaysia Weekly, on December 19 - 25, 2016. Investment vehicles have had to evolve in recent years because of factors such as the need for diversification in the current low-yield, low-return environment, rising demand from a savvier generation of investors and advancements in technology. The changing landscape has also prompted the authorities to lower regulatory barriers, paving the way for a broader segment of investors to participate in wealth building. Thus, complex investments that until recently were only accessible to high-net-worth individuals (HNWIs) are now being made available to retail investors. Such investments include precious metals and stones, real estate and private equity (PE). These investments also appeal to sophisticated investors, institutional investors and family offices as they provide more options than before in terms of variety, access and cost. Take gold. People have been investing in the precious metal for a long time, first by owning the metal itself and later, through gold investment accounts, unit trust funds and gold mining stocks. With the internet, gold trading was made easier with online platforms. But now, mobile technology allows people to trade investment-grade gold with the tap of a finger. Precious stones as investments, diamonds in particular, have had a rather tumultuous track record. But today, there is an electronic trading platform aimed at making the diamond trade more transparent by allowing real-time pricing and liquidity. Investing in real estate used to involve purchasing a property, owning property stocks or buying into real estate investment trusts. The new crowdfunding platforms, however, are allowing investors to access the real estate debt market. For decades, private equity investments had been the domain of institutional funds and the wealthiest individuals. Today, investment vehicles such as funds are giving investors access to a dozen or even several dozen PE funds across multiple geographical regions and fund managers at a lower cost. Here is a look at these new ways of tapping traditional investments. In Malaysia, PE has become more accessible to HNWIs under the Lodge and Launch framework and wholesale fund structure, launched by the Securities Commission Malaysia in June last year. With this framework, asset management firms can launch wholesale funds that use alternative investment strategies, including private equity. They are also given more flexibility in deciding the minimum investment amount for their wholesale funds. For instance, the RHB Private Equity Opportunity Fund 1, which was launched in July, has a relatively low minimum investment amount of RM100,000. Typical PE investments used to require an investment of at least RM500,000. The wholesale fund imposes a sales charge of up to 5% and an annual management fee of 2.5%. The target return is 15% to 20% over seven years. The fund invests in both PE and private debt instruments and does so directly and through funds of funds. It also uses the co-investment approach, partnering premier PE firms and leveraging their expertise when investing in companies. As with other PE funds, investors are not allowed to withdraw their money before the maturity date, which is Sept 10, 2023. Investors of wholesale funds that invest in public equities are generally allowed to sell their holdings at any time. While the minimum investment of RM100,000 has made PE investments more accessible to local investors, the amount is still higher than in mature markets. In the US, investors can tap private equity investments through exchange-traded funds (ETFs) for as low as US$11 (RM48.90) per share. For example, PowerShares Global Listed Private Equity Portfolio is an ETF that invests in the equities of public-listed PE firms. It tracks the Red Rocks Global Listed Private Equity Index, which in turn, tracks the performance of 40 to 75 public-listed PE firms. Investors can buy a single share of this ETF online or through brokers at a net asset value of US$11. As at Dec 2, the fund had generated returns of 5.63%, 9.84% and 79.20% over the past one, three and five years respectively, according to Bloomberg. The ProShares Global Listed Private Equity ETF, meanwhile, tracks the LPX Direct Listed Private Equity Index, which comprises up to 30 listed PE firms. The ETF has generated a return of 8.30% and 13.87% over the past one and three years respectively. It has seen a return of 29.29% since its launch on Feb 26, 2013, according to Bloomberg. The ETF was trading at US$38.59 per unit on Dec 2. Malaysia still has some way to go before players adopt such strategies. 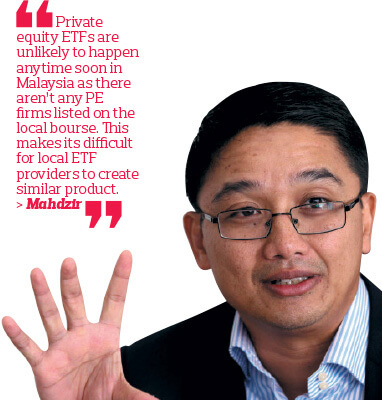 Mahdzir Othman, CEO of i-VCAP Management Sdn Bhd, says private equity ETFs are unlikely to happen anytime soon in Malaysia as there aren’t any PE firms listed on the local bourse. This makes its difficult for local ETF providers to create similar products. i-VCAP Management is an asset management firm wholly-owned by Valuecap Sdn Bhd. It operates four of the eight ETFs listed on Bursa Malaysia, investing mainly in the indices of local and regional equities. Singapore-based EthisCrowd is the world’s first real estate Islamic crowdfunding platform. It aims to make property investing more affordable and liquid. The platform pools investors’ money and channels it to property developers to build houses and sell them. This allows just about anyone to invest in real estate through a structure that combines crowdfunding with peer-to-peer financing as it also has access to its associate, P2P funding platform Kapital Boost. Managing director Umar Munshi says it has successfully funded 14 housing projects over the last 30 months. The funds will be used to build 5,000 houses in Malaysia and Indonesia. EthisCrowd expects to generate a return of 4% to 52% for its investors. It offers investments in both the ringgit and the Singapore dollar, depending on where the projects are located. As at Dec 12, the minimum investment for projects ranged from S$500 to S$10,000 and RM3,000 to RM5,000, making it a smaller investment than buying a house. “Investors are now allowed to enter and profit from the capital-intensive real estate industry, which was previously monopolised by the wealthy,” says Umar. Unlike other debt financing platforms, there is no capital guarantee or fixed rate of return for investors on this platform. Instead, it uses a mudarabah (profit-sharing contract), he says. The platform currently funds affordable houses in Indonesia, leveraging the real estate boom there, which is being driven by a stable, fast-growing economy. Umar says it will continue to fund affordable housing in the country as there is good demand from the public and it is supported by investors and stakeholders such as financial institutions. “It is a real problem that needs to be addressed and it has a social aspect. There is a lot of demand for affordable housing. We can also get support from the government and Islamic banks. This is the reason investors believe in and invest through us,” he says. EthisCrowd raised RM100,000 for Malaysian developer Qayz Holdings Sdn Bhd to build 10 affordable homes in Jerantut, Pahang, earlier this year. The houses are for the families who lost their homes in the 2014 floods that ravaged the East Coast. “The new houses will be built using a modern and advanced method called integrated building system, which has stronger lateral resistance to any future flooding. It also provides better heat insulation and fire retardation and it will be environmentally friendly,” says Umar. Fractional ownership, or investing in a fraction of a business, is gaining traction among investors. Owners Circle, a local business matching platform has been advocating this structure to the masses as a way to reap the rewards of co-owning a business. While the concept has existed for decades, it is has been mainly used by the wealthy to share luxury assets. This is typically done in the form of private arrangements between family and friends. Fractional ownership negates the need for bank financing and relies instead on a pool of funds raised from the participants. The minimum investment can start from as low as RM10,000, depending on the project undertaken. Like all other investments, fractional ownership comes with risks and you could lose your money. However, measures are taken to reduce the risks, such as having the businesses undergo due diligence by an independent equity research company. Potential investors should note that this is a rather illiquid investment as it is not easy to dispose of their ownership without affecting the business they have invested in. Investors have been buying gold over the internet on various platforms for more than a decade, says Robin Lee, founder and CEO of HelloGold Sdn Bhd. The company’s shariah-compliant gold savings platform and mobile application was available for download in Malaysia last month. Unlike its UK counterpart, transactions on HelloGold can only be done via the app, which allows users to trade investment-grade gold with their smartphones. But before they can trade, they have to register for an account by taking a photo of and submitting their proof of identification, as well as other relevant information. Currently, only the Android app is available. “Those using iOS will have to wait until the first quarter of next year. Investors who are interested in our app can search HelloGold on YouTube. We have a short video to introduce the app and explain briefly how to use it,” says Lee. He advises investors to buy gold through the app after it is officially launched as there will be a special promotion following the launch event. “The app is already available for download, but the official launch will be at the end of this year or the first quarter of next year by us and our partner, which is a local financial institution and listed company. Investors will be offered a special promotion after the launch,” he says. Besides providing users the convenience of trading gold, the app also allows them to buy a fraction of a gold bar for as low as RM50. As at Nov 28, physical gold cost RM220 per gram in the retail market and RM173.72 per gram through a gold investment account. Given the exchange rate for spot gold to the US dollar at RM173.72 per gram, investors who buy gold for RM50 through HelloGold will own 0.28g. However, to redeem physical gold, investors have to increase their holdings to at least 1g. HelloGold charges a 2% annual fee and a spread on top of the current gold price. “The spread depends on the volume of gold we buy from the bullion providers. The spread will be lower if the volume is larger,” says Lee. This is lower than the cost of investing in a gold investment account, which charges a spread of 3% to 4% on top of the prevailing gold price and an annual fee of about 3%, based on the information available online. HelloGold plans to allow investors to use the gold purchased on its platform as collateral to apply for personal loans from its supporting partners, such as financial institutions. The loan amount could be as high as 70% of the value of gold owned, depending on individual credit scoring. Investors can also transfer gold via the app without any charges. This function is unique to the HelloGold platform as it is cannot be done via gold investment accounts. Acknowledging the controversy and subsequent scepticism following the number of gold investment schemes and platforms that have folded in the last few years, Lee says the company adheres to international best practices adopted by gold bullion providers globally to ensure transparency. HelloGold’s physical gold is stored in Singapore by BullionStar, a third-party bullion dealer and storage provider. HelloGold undergoes annual audits conducted by Bureau Veritas, the London Bullion Market-approved third-party auditor, which ensures that the gold bars held in the vault tally with the records of the company. It also conducts tests to ensure the purity of the bars, says Lee. “Our app users can opt to pay S$99 to have direct access to the documentation of the gold bars and look at the physical gold in person,” he says, adding that the gold held by the company is currently insured up to US$150 million. Despite the high price tag associated with diamonds, the gems have not been a good investment. But the Singapore Diamond Exchange (SDiX) hopes to change that with the world’s first electronic trading platform and commodity exchange in physically settled diamonds. For decades, investing in diamonds has not been straightforward. They have been priced and sold based on individual contracts through hubs such as Antwerp, Tel Aviv and Mumbai. The exchange’s founders, Alain Vandenborre and Linus Koh, set up the platform to bring real-time pricing and liquidity to the market as well as to create a transparent and regulated marketplace for diamonds. 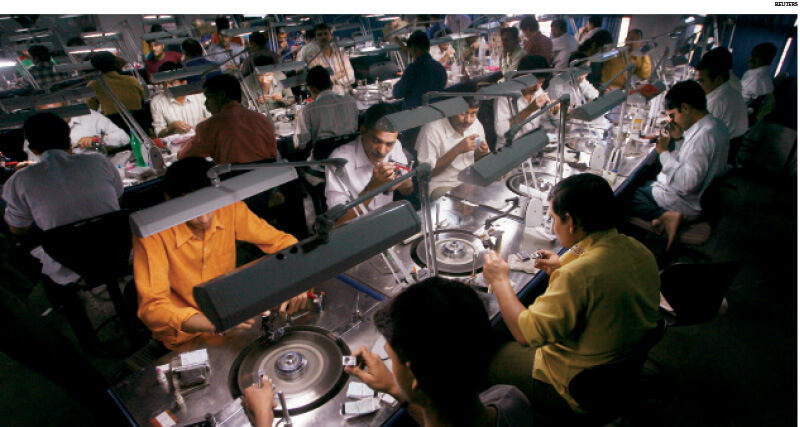 The diamond exchange is backed by Singapore sovereign wealth fund Temasek Holdings. Diamonds have a low and sometimes negative correlation with other assets, hence it makes for an efficient portfolio diversification tool, says SDiX. “Their performance over a 10-year period shows that 3- and 5-carat diamonds yield results that are marginally less than gold and the Nasdaq, which have returns of 98.7% and 66% respectively,” says Koh. The exchange is planning to develop a fully warranted physically delivered diamond futures contract with multiple points of delivery, serving the risk management needs of diamond suppliers — of both rough and polished stones — who currently produce only what they have sold forward. Prior to the launch of the exchange, diamond traders only had the Rapaport Price List as an indicative price guide for buying and selling diamonds. SDiX, on the other hand, is an electronic exchange with a fully transparent price discovery mechanism. “The platform gives financial markets participants immediate access to accurate, real-time pricing information and a benchmark price to value diamonds as an asset, thus enabling the trading of diamonds with the same ease as other asset classes,” says Koh. Diamonds on the exchange can be traded through registered brokers in London, Singapore, Hong Kong and Dubai. “Since its launch, SDiX continues to welcome participants from major wealth management centres and diamond trading hubs around the world. The exchange is benefiting from the considerable growth of emerging markets,” says Koh. SDiX’s primary goal is to develop a vibrant spot trading market for accredited investors. Since its launch, efforts have focused on building liquidity on the platform through new intermediaries and direct participants. “The SDiX technology breaks down barriers to allow wider participation in the upstream diamond markets and enable direct relationships between wholesale suppliers and end users, including investors,” says Koh. A global network of service providers support the exchange and its members with grading, vaulting and settlement.